“I like to have a secret love affair, a hidden life,” said Graham Greene, “something to lie about.” Partly, that hidden life was espionage, but mostly it was adultery. Greene was married and he had a special liking for clandestine liaisons with the wives of his friends. Constancy or faith versus betrayal—religious, sexual, personal, political—his best works pivot around these dichotomies, intensifying the tension between them without trying to resolve it. Greene’s protagonists must somehow live with their bad consciences, as Greene evidently managed to live with his. I imagine he justified the betrayals by telling himself that his friends brought it upon themselves. Michael Redgrave and Audie Murphy in Mankiewicz’s 1958 film. Redgrave is wonderful, but nobody can save a picture singlehandedly. Innocence, to Greene’s mind, at any rate, was blameworthy. The quiet American, Pyle, was naive, idealistic, and dangerous: “I never knew a man who had better motives for all the trouble he caused.” The cynical journalist who narrates the novel, Fowler, is prepared to lie and cheat to keep Phuong, his Vietnamese mistress, from running off with Pyle. Ultimately, Fowler betrays Pyle but like Raskolnikov in Dostoyevsky’s Crime and Punishment, he faces himself squarely. “Was I so different from Pyle, I wondered? Must I too have my foot thrust in the mess of life before I saw the pain?” He doesn’t like himself much, but he’s not asking us to like him either. Rather, he forces us to face uncomfortable truths about the West’s imperial blunders. No heroes, no victims, no illusions, just an open-eyed appraisal of the mess of life, and love, and geopolitics, mistakes played out endlessly for the most venal of motives. And that’s what’s wrong with both film versions of The Quiet American. Neither Joseph Mankiewicz nor Philip Noyce could leave well enough alone. Mankiewicz reworked key elements of the story to counter what he saw as Greene’s anti-Americanism, turning Pyle into a cartoonish good guy, a boy scout. Absent is Greene’s irony, his disparagement of the American as a simple-minded meddler, blind (notwithstanding his Harvard education — or perhaps because of it) to the complex reality of the country he has come to save. Fowler’s the fool here. Othello-like, he is blinded by jealousy and allows himself to be played by the Communists. Mankiewicz even has him read Othello’s speech as he sets the American up for assassination, to make sure the audience gets the point. Caine’s pretty wonderful too, and the 2002 film is well worth watching. Fidel Castro had just taken over Cuba when filming on Our Man in Havana began in April, 1959. He and Che Guevara dropped in on the set and fraternized with the cast; Maureen O’Hara was quite taken by Che, “a real freedom fighter,” in her words. This from a woman who adored John Wayne and Ronald Reagan. Wormold, a middle-class Brit, does not belong to “the torturable class,” Segura blithely admits, whereas the poor in Cuba, and throughout Latin America, apparently do. Greene’s irony comes across better in the book, although Kovacs is brilliant in the checkers game, where the two adversaries use miniature liquor bottles in place of checkers. I loved the novel, but I love the film even more. Besides Guinness, O’Hara, and Kovacs, you’ve got Noel Coward as the urbane (and slightly ridiculous) recruiter of secret agents, Hawthorne, and Ralph Richardson as the even more ridiculous spymaster “C.” Burl Ives plays Dr. Hasselbacher, an emigré with a communist past. In real life, Ives had just named names before the House Un-American Activities Committee. In the film, he betrays Wormold, his only friend, then has second thoughts. Our Man in Havana would be Greene’s final collaboration with director Carol Reed. 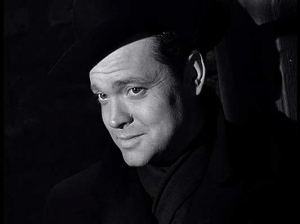 It’s more light-hearted than the pair’s most indelible project, The Third Man, but still packs a punch. Viewed with a daiquiri in hand, it goes down quite smoothly. It’s not difficult to understand what Anna saw in Harry Lime, the crooked American whose death is at the center of this film. Amid the ruined city of Vienna, the grim faces of its inhabitants, the climate of suspicion and paranoia that prevails throughout the occupied zones, regardless of which army is in charge, Harry stood out. He never grew up, “the world grew up around him, that’s all,” Anna explains to Harry’s old friend, Holly Martins. She refuses to face the truth: that Harry’s black market dealing caused the deaths of countless children. She prefers to hold onto her romantic illusions. Can you blame her? Three years after the Second World War ended, Europe — as embodied by the once shimmering cultural capital of Vienna — is bombed out, exhausted, physically and morally. The grand ideals for which the war was fought are nowhere in evidence. Freedom seems to be particularly lacking: Holly is shadowed, manipulated and lied to, pushed around by the British occupiers, threatened by the black marketeers. But there’s Harry, staging his own death to free himself from surveillance. “He could fix things… [he knew] how to avoid this and that,” Holly says admiringly. Holly himself is hopeless at fixing anything, barely able to look after himself in corrupt postwar Vienna. Straightforward American integrity is a liability in this setting. What’s needed is a clever liar like Harry. And our first glimpse of him, sheltered in a doorway, unexpectedly illuminated by a streetlight, confirms the impression that he alone is at ease in the darkly-lit world. Look at how he’s smiling. Seductive, the way he doesn’t let his guard down even when he knows you. Even when you love him. Irresistible to Anna, for sure. I suspect that Harry Lime is Graham Greene’s alter ego. “I like to have a secret love affair, a hidden life. Something to lie about,” the author of “The Third Man” once said. Anything is possible from a man like that: betrayal, certainly, but also excitement. He gets his thrills from danger, and danger was everywhere in those days, but his zest for life keeps him one step ahead of the police. Time and again you think he’s cornered during the dramatic chase in the sewers, but he manages to outwit his pursuers. We see his fingers poking up through the grate the way a plant sends out new shoots. Toward escape, toward the air. Toward life.